Good evening, fellow Salon Members! I apologize for the lateness of this posting, but I had a rather full day yesterday. I had brunch with some friends and family and then spent the early afternoon at an antiquarian book show that is help locally twice a year. Usually, I walk away empty handed, but not this year! I found a lovely little edition of Charles Dickens' Old Curiosity Shop (for $5!) and several 70s edition Agatha Christie paperbacks (each only $1!). I decided instead of going real crazy and buying up everything she had in the Christie paperbacks, I'd limit my shopping to finish off the Miss Marple books that I was missing, and have almost the entire lot now, with the exception of 3 books. Overall, a really good time. I have been reading Cormac McCarthy's The Road and hope to finish that either tonight or tomorrow evening. What a powerful book! I was immediately drawn into the story, and the sense of hopelessness and despair is practically tangible, so much so that when the father and child do have those shining moments of hope, I feel genuine relief for them. Amazing. Not much else to report, really. March has proven to be my worst reading month in ages. Hopefully I'll be able to get myself back on track in April. Since my last Salon posting, I've read half of The Road, still have not finished The Body in the Library and read Neil Gaiman's Blueberry Girl (all 32 pages of it). It's rather embarrassing to even have to admit to so little reading. Thanks to Irish for pointing this out to me! This is a beautiful prayer written by Neil Gaiman for his friend Tori and her soon to be born daughter Tash. It is about empowering her daughter to be her own person, to let her grow and be adventurous and live life to its fullest. The accompanying illustration by Charles Vess are suited perfectly to the story. It is a very quick read, but one that left me smiling. A must-buy book for anyone that you know who is having a daughter. I received Cormac McCarthy's The Road for my birthday from my uncle in the mail last. We've had a running debate of sorts over the years that I will never enjoy the books that he sends me, mostly because I always feel that he is under the impression that unless an author is dead, they can't be considered a good writer. So this year, he sent me The Road. He sent a note along with it, saying that even though Cormac McCarthy is still living, I still probably won't like the book. How wrong he is. I sat down towards the end of the night last night to just give the first couple of pages a try, and when I looked up at the clock, it was 1am and I had read half of the book. If I hadn't had to go to work in the morning, I probably would have just stayed up to finish it. What I've read so far is amazing. The sense of desolation that McCarthy imparts is immediate, making the few moments of happiness for the father and his son truly shine through. If you have never read this book before, based on what I've read so far, I'd highly recommend it. I highly doubt the second half is going to be disappointing. I'll have it finished by the weekend and talk about it at my Sunday Salon. I'm excited to discover that J.F. Englert's third installment in his A Bull Moose Dog Run mystery series, A Dog At Sea, has been posted up to Amazon, to be released on September 29, 2009! I discovered this series through LibraryThing last year. The books follow the adventures of Randolph, canine sleuth extraordinaire, and his human Harry, as they navigate their way through unexpected bachelorhood while solving murders. Randolph is a black Lab, and as I have a soft spot in my heart for black Lab's, I had to give the books a try. Well, I can't tell you how much I enjoyed reading these books! You can read my review of A Dog About Town here and A Dog Among Diplomats here. I even had the good fortune to be able to interview J.F. Englert last year, who graciously gave of his time to answer my questions and supplied 5 sets of his books to give out to my readers! If you are looking for a well-written and fun series, I'd highly recommend giving these books a try! Good morning, fellow Salon Members! Another woefully lacking reading week for me! After being struck down with the worst cold in years, I was so busy trying to get caught up at work that the last thing on my mind when I got home this week was more reading. 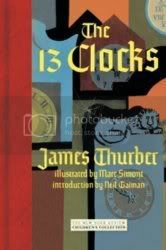 I was able to read one book, however, James Thurber's The 13 Clocks. It was an enjoyable little story, I'm just not sure it entirely deserves the amount of praise that it receives. 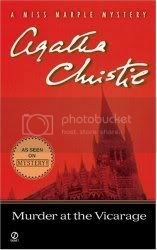 This week I would like to finish reading Agatha Christie's The Body in the Library, just so that I can say I read one more book for my Miss Marple March. I may rethink that; instead of trying to get all the books read in March, which obviously won't happen now, I'll look at it as thought I'm marching through them! Beyond that, I'm not quite sure what I've got planned to read. I have several books arriving in the mail this week (two from bookcloseouts.com and two from Amazon) so I may try reading one of those when they arrive. I have been on a Charles Vess spree lately, and I discovered a book illustrated by him called Ballads, so I ordered that from bookcloseouts.com. It is a collection of British, Scottish and Irish folk songs that have been written into sequential art form. Vess provides the illustrations and a variety of authors, including Neil Gaiman, provide the stories. I also ordered another copy of Peter Pan, with accompanying illustrations by Vess. 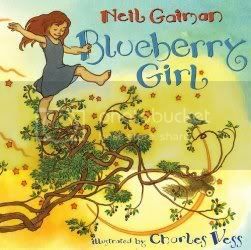 I ordered Neil Gaiman's Blueberry Girl, also illustrated by Vess (see a theme here? ), and James Dashner's The 13th Reality, Book 2 from Amazon. That's all for today. I'm getting ready to run some errands and grab some lunch with my mom, so hopefully there'll be some reading later on today. Happy reading, everyone! 13 - A Magical Reading Number? It has just occurred to me that I have already read three books with the number thirteen in the title: The Thirteenth Tale by Diane Setterfield, The Thirteen Problems by Agatha Christie and The 13 Clocks by James Thurber. I'll also be picking up the second book in James Dashner's The 13th Reality series, so will probably read the first book to refresh my memory. I wonder if there are any other books out there with 13 in the title that I can read this year? I'm not quite sure what to make of James Thurber's The 13 Clocks. To be honest, the biggest reason that it caught my eye was the introduction by Neil Gaiman. Then I discovered it was on the 1001 Books list, so I thought that it would be worth picking up. And it was; but I just don't know what to think of it. In his introduction, Gaiman says that The 13 Clocks is one of the best books ever written, or something like that. I have to agree that it is a fun book, but calling it one of the best books ever written I think is stretching it a bit far. The 13 Clocks is a hard book to label; is it YA? A child's fairy tale? Something written for adults? I can honestly say yes to all these questions. It has just about every aspect of the typical fairy tale present: there is a damsel in distress, an evil duke, a prince who comes to the rescue, impossible tasks, magical creatures, curses and a happily ever after. The Princess Saralinda is something of a captive to her wicked "uncle," the Duke, who is actually not her uncle, but her kidnapper, and who plans to marry her on her 21st birthday. She has had many suitors over the years, but each the Duke gives an impossible task to complete for her hand, or he simply kills them for practically no reason. Along comes the prince, Zorn of Zorna, disguised as a traveling minstrel, who goes on an impossible quest set forth by the Duke. Accompanying Zorn is the Golux, who seems to be something of a wizard, but maybe not, and together they accomplish the task, but just barely. I'm giving nothing away here, as we all know how these fairy tales end, and this particular tale follows in the footsteps of every one before it. Marc Simont's illustration are very simplistic, but they match the tone and feel of the story perfectly. I found them a fresh accompaniment to the story. Don't take me the wrong way, I really enjoyed reading The 13 Clocks. Thurber created a fun little story, but I'm just not 100% convinced that it deserves the amounts of praise that has been heaped on it, though. Good morning, fellow Salon Members! This has been a most discouraging reading week for me! I came down with the world's worst cold on Tuesday, and have had all of my energy sucked away and have only left the house twice since Wednesday, once for the doctor and then again last night, just to get out of the house - but then the simple fact of walking around the grocery store for about 45 minutes completely wore me out. Yeah, it's a sad state of affairs around here right now. But, you'd think with all this time at home that I would have taken advantage of it, and read book after book, right? Well, to be honest, that's what I thought too, but alas, no. I haven't even had enough energy to read. So, unfortunately, I will probably only be able to complete half my Miss Marple March. Oh well. I can say, however, that I have watched more TV in the last 4/5 days than I have in probably the last year. So, hopefully everyone has had a much better week than I have. Happy reading, everyone! The Thirteen Problems is a collection of loosing connected short stories. The first six stories take place as part of The Tuesday Night Club, where a select group of friends come together each week for one to relate some mysterious, "unsolved" tale that only they know the answer to, to see if anyone else can come up with the answer. Each and every time, Miss Marple is able to deduce the answer. The second set of stories take place at a dinner party where Miss Marple is invited at the request of Sir Henry Clithering, who was also part of The Tuesday Night Club and is a retired head of Scotland Yard. Again, Miss Marple reasons her way to the answer of each mystery. The final story takes place some time after the dinner party, when Miss Marple discovers the Sir Clithering is staying in St. Mary Mead, and she enlists his help in solving a mysterious death in the village. Really, these stories are rather simplistic, and it seemed a rather big jump in some cases for Miss Marple to reach the conclusions that she did, but I guess that's the point of the stories; that Miss Marple has such a keen insight into the human condition, and that everything that she observes always reminds her of something else, that not much escapes her powers of observation. From what I understand, most of these stories had originally been published prior to Murder at the Vicarage, so that may explain why they are so simplistic; they were written for the express purpose of simply introducing Miss Marple. Not a bad book, but I think that Miss Marple really has a much better chance to shine through in a novel rather than these short stories. Murder at the Vicarage is Agatha Christie's first book to star one of her greatest literary creations, the indomitable Miss Jane Marple. Miss Marple may appear to be your typical "little old lady," but her powers of observation, honed from living almost her whole life in the small village of St. Mary Mead and giving her an acute insight into the human condition, prove to the match of everyone in the village, police included, when it comes to solving the murder of Colonel Protheroe. When you get right down to it, there isn't much to the story. 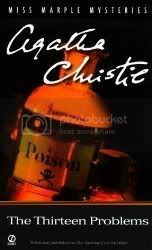 It is a fairly typical Christie mystery, making you think you know the conclusion until she pulls the rug right out from underneath you when she reveals the mastermind behind the murder. The murder in question is that of Colonel Protheroe, a not-much-loved member of the village, who is found murdered in the vicars writing room. There are plenty of people with motives, and plenty bits of misdirection, but it is up to Miss Marple to put the pieces together and discover the identity of the true culprit before it's too late. A fun little read with an endearing character in Miss Marple, the whole story is wrapped up with a nice and tidy ending. Not a bad choice if you're looking for an easy mystery read. Good morning, fellow Salon Members! Sorry for the lateness of my posting today. I spent this past weekend visiting a friend in Chicago, and just got home from the Windy City! We spent a lovely (if not partially rain-soaked) couple of days taking in the sites and catching up. It was a good weekend. My Miss Marple March is going well. I've finished Murder at the Vicarage and The Thirteen Problems (reviews to come sometime this week) and have got a decent start on The Body in the Library. I picked up The Moving Finger and Three Blind Mice whilst in Chicago and will probably order the remaining books from Amazon, so I should be going on quite nicely with the remainder of my month's reading! Not much else to report, other than one little other bit of business. We have a winner of the autographed copy of Penelope Przekop's Aberrations!! Congratulations, Debs Desk, you were randomly chosen to be our winner! Everyone's name was thrown into a bag the appropriate number of entries, and my roommate pulled the winning name. Thank you again to everyone that participated and an especially big thank you to Penelope donating the book for the drawing. Please make sure to check out her blog, Aberration Nation, as well! OK, that's it for today. It's been a long travel day, and I think I hear the siren call of a book and my bed, and that call must be answered. Happy reading! Whilst reviewing some old comments on the blog, I discovered that somehow I missed that I have a fabulous blog! Caspette, who runs the blog The Narrative Causality (you should go check it out!) 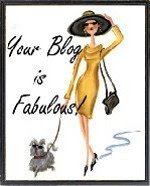 nominated my blog for the Your Blog is Fabulous award!! Thank you so much, Caspette! This makes my day!! Penelope Przekop, author of Aberrations and the blog, Aberration Nation, has offered to give one lucky reader of from my bookshelf... an autographed copy of her novel. I received a review copy of Aberrations last year and LOVED it! We want to spread the word as far and as wide as we can about Aberrations, so I want you to be creative. Let me know how many ways you can spread the word about this giveaway through as many social networking sites as you can (Myspace, Facebook, Twitter, your own blog, etc) and relink them back to this post. Since I'm not a part of all of these networks myself, I'm putting everyone on the honor system here to let me know how you've posted about the book and the giveaway. For each way that you can come up with to promote Aberrations, I'll throw your name in a hat, so the more ways you can think to promote the book, the better your chances of winning an autographed copy! Once you receive the book and read it, I'd like for you to post a guest review to my blog, as well as post the review to Amazon and any other book site that you belong to (Good Reads, B&N, LibraryThing, etc). I truly believe that Penelope has created a fantastic story, and the more people know about it the better so put those thinking caps on and spread the word! I'm also going to place this in the Bookroom Reviews Book Giveaway Carnival to help spread the word even more! You should stop by and check out all the other book giveaways that Bookroom Review is hosting right now. There's a fantastic selection of books over there! Sunday Salon 28 II 2009 Back to the Salon, some reviews & new challenges and a BOOK GIVEAWAY! Good morning, fellow Salon Members! Oh, it has been awhile, hasn't it? Things have been very hectic these last couple of months, so I took a break from the Salon for awhile, but I'm happy to say that as life begins to fall back into familiar routines, I'm finding more time to spend in the online world with my fellow readers! I just read an excellent book by Zoë Heller (of What Was She Thinking? Notes on a Scandal fame) titled The Believers. I received this as part of Barnes & Noble's First Look program and really enjoyed it (you can read my review here). According to Amazon, it is going to be released on Tuesday, March 3, 2009, and you can either order it from the link below or pick up a copy at your favorite local bookseller. Some other books of note that I have read recently are Diane Setterfield's amazing The Thirteenth Tale, Neil Gaiman's creepy Coraline and Nancy Atherton's cute and clever Aunt Dimity's Death. Reading Aunt Dimity could be a danger, as I'm finding it an enjoyable read, but it's the first in a series of cozy mysteries, so there's another series of books that I'm going to be looking for! Look for that review later today. My 9-9-9 Challenge is not going as well as I would like it to be going (I've only read 5 books from the list so far!) but I still have 10 months to go, right? My problem is I keep finding books either at the store or on my shelf that seem to be catching my interest more than what I had scheduled myself to read, so I really need to focus on that reading list!! It's all about the self-discipline right now, and when it comes to books, I might as well throw all the discipline I have right out the window. In response to that reading challenge however, I am going to be taking off most of the month of March for a Miss Marple March! My roommate bought me an import copy of Agatha Christie's Miss Marple's Final Cases a while back, and since I want to read it but am a stickler for reading these books in order, have decided to read all of the 14 main Miss Marple books throughout the month of March. I know that she turns up in some of the other short story collections, but there are 12 novels and 2 short story collections that feature her alone, so those are the ones that I will stick with. This should also help restart my personal Agatha Christie challenge. Come back throughout the month of March to see which murder Miss Marple is solving next! One last bit, and the part that I'm most excited about! Penelope Przekop, author of Aberrations and the blog, Aberration Nation, has offered to give one lucky reader an autographed copy of her novel. I received a review copy of Aberrations last year and LOVED it! We want to spread the word as far and as wide as we can about Aberrations, so I want you to be creative. Let me know how many ways you can spread the word about this giveaway through as many social networking sites as you can (Myspace, Facebook, Twitter, your own blog, etc) and relink them back to this post. Since I'm not a part of all of these networks myself, I'm putting everyone on the honor system here to let me know how you've posted about the book and the giveaway. For each way that you can come up with to promote Aberrations, I'll throw your name in a hat, so the more ways you can think to promote the book, the better your chances of winning an autographed copy! Once you receive the book and read it, I'd like for you to post a guest review to my blog, as well as post the review to Amazon and any other book site that you belong to (Good Reads, B&N, LibraryThing, etc). I truly believe that Penelope has created a fantastic story, and the more people know about it the better so put those thinking caps on and spread the word! That's it for today. I'm going to go get a cup of coffee and sit down with Murder at the Vicarage and see if I can figure out whodunit before Miss Marple! Lori Shepherd has been living a very lonely life since her mother passed away. Her apartment is meek and shabby, she works with a temp agency, bouncing from one job to the next, wondering where she's going to get the money to pay her ever-growing mountain of bills. all that changes when she receives a letter from the mysterious law firm of Willis & Willis, telling her that she is about to inherit a large estate from Dimity Westwood, but only if she can solve a puzzle hidden in the letters at Dimity's cottage in England. The only problem? Dimity was nothing more than a character in the Aunt Dimity stories that Lori's mother told her as a child. Or was she? Being the first in a series, and also being labeled as a Crime Mystery, I can only assume that the rest of the series follows suit as a true cozy mystery series, while this volume is nothing more than character introduction and set up. There really is nothing truly mysterious in this book, which confused me at first, but as the story progresses and each of the characters are fleshed out, I found myself more and more endeared to them. With something of a Cinderella story and with part of a ghost story added in for good measure, it became more of a book about love and redemptive power of forgiveness. It was a quick little read (it took me an afternoon), and I enjoyed it enought o see how the rest of the series progresses.